It’s fun being inventive, though I admit it’s a far cry from being a well-trained cook. As an amateur I believe there’s a place for both, and that’s in the finished plate. Case in point was last evening’s dinner. Two very basic ingredients taken to another level. Classically trained chefs, please forgive me. 1. Parboil 12oz of Beans for 5 minutes. 2. Drain, blot dry & add the EVOO. Toss & add Parmesan Bread Crumbs & crumbled Gorgonzola Cheese. 3. Roast in a 450 oven until caramelized & slightly charred. About 15 minutes or to taste. 1. Season the Chops & marinate them with Pomegranate Molasses. Set aside for 30 minutes or more. 3. 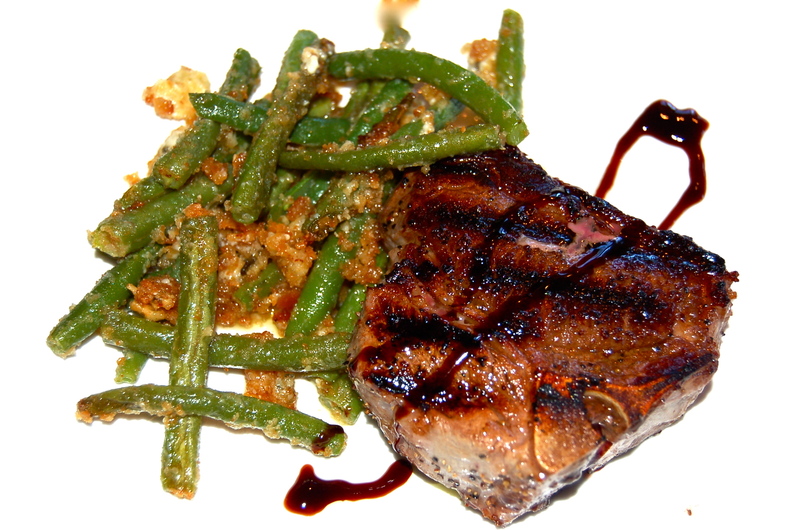 Plate with the roasted Green Beans for an easy & delicious combination.